Saint John Vatatzes the Merciful, or John III Doukas Vatatzes, was the Emperor of Nicaea from 1221 to 1254 and one of the most remarkable among the successors of Constantine the Great, being the chief architect of the restored Roman Empire, and a respected leader who encouraged justice, charity and a cultural blossoming. He was born ca.1192 in Didymoteicho and died on 3 November 1254 in Nymphaion. His feast day is on November 4. With rare unanimity late Roman historians unanimously glorify him. Seven years after his death when his grave was opened, a sweet fragrance permeated the surroundings, and they were surprised to find that his body was incorrupt, a clear example of holiness. His relics showed no sign that he was in fact dead; the color of his body was like that of a living person, and even his clothes had not deteriorated after 7 years and looked like they had just been newly sewn. A half-century after his death, John Vatatzes was so beloved and esteemed by the people that he was commemorated as a saint under the name John the Merciful. A contemporary account during the reign of Andronikos Palaiologos (1282-1328), mentions that around the time that the Turks invaded Magnesia, on several occasions the castle guardsman had witnessed a lit candle circling around the city walls. He sent men to investigate the phenomenon but to no avail. Then the deaf-mute brother of the guardsman was sent, and he was given a revelation, and was completely healed upon his return. He said that at the area where the lit candle had appeared, he found a man of a grand royal stature, who loudly urged the Christians to continue the defense. Later he recognized the image of the man he had seen when visiting the holy shrine of Saint John Vatatzes. Since then John was recognized as a Saint and his memory was set to be honored on November 4. George Akropolites mentions that the people saw to the construction of a temple in his honor in Nymphaeum, and that his honor as a Saint quickly spread to the people of western Asia Minor. Miracles began to be connected with his memory and The Life of St. John the Merciful was composed, a sort of popular canonization. As noted by his biographer, Christians who went on pilgrimage to pray before the Saint were rewarded with miracles; the diseased were healed and demons were expelled at his holy relics. The clergy and population of the Lydian city of Magnesia and its surroundings, where the Emperor was buried (Monastery of Christ the Savior on Mt. Sipylos (Monastery of Sosandra), gathered annually on November 4 in the local church and honored the memory of the late Emperor John the Merciful. 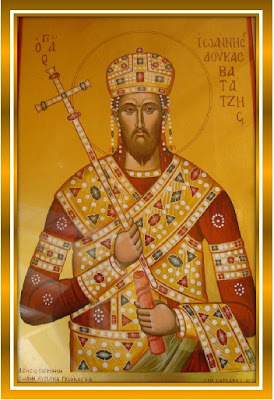 His incorrupt relics were transferred to Constantinople, which had been liberated from the Franks, where the legend of the reposed King became associated with him. At the time of the fall of Constantinople to the Ottoman Turks, his relics were hidden in a catacomb. The honor of the saintly emperor survived until modern years, mainly in the Metropolis of Ephesus. There is a reference in the Menologia for the commemoration of “John Doukas Vatatzes” on the 4th of November. Nikodemos the Hagiorite (1749-1809) composed a service in honor of the Emperor-Saint John Vatatzes the Merciful, commissioned by the Metropolitan of Ephesus. On November 4, 2010 the first and only Orthodox Church in the world was dedicated to St. John Vatatzes, in the city of his birth, Didymoteicho (Metropolis of Didymotichon, Orestias and Soufli).